This briefing was organized by MPI, the Migration and Health Research Center at the University of California, Davis; the Health Initiative of the Americas at the University of California, Berkeley’s School of Public Health; and the UC Global Health Institute. 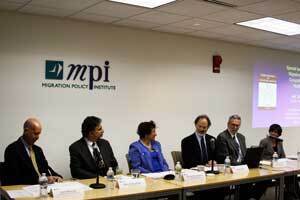 The briefing, which focuses on migrants’ higher rates of on-the-job injuries, was moderated by MPI Senior Vice President Michael Fix. Panelists include John Howard, Director, National Institute for Occupational Safety and Health; Deborah Berkowitz, Chief of Staff, Occupational Safety and Health Administration, US Department of Labor; Marc Schenker, Director, Migration and Health Research Center, University of California, Davis; Bruce Goldstein, Executive Director, Farmworker Justice; and Xochitl Castañeda, Director, Health Initiative of the Americas, School of Public Health, University of California, Berkeley. During this MPI speakers series, T. Alexander Aleinikoff, United Nations Deputy High Commissioner for Refugees, discusses voluntary repatriation, local integration, and resettlement. Panelists include Demetrios Papademetriou, MPI President, and Kathleen Newland, MPI Director of the Migrants, Migration, and Development, and Refugee Policy Programs. Click here for the Leadership Visions discussion with Immigration and Customs Enforcement Chief John Morton and here for the discussion with US Citizenship and Immigration Services Director Alejandro Mayorkas. The Migration Policy Institute holds a briefing to discuss the release of the latest paper by its Labor Markets Initiative: The Impact of Immigrants in Recession and Economic Expansion. Speakers are report author Giovanni Peri, UC Davis Professor of Economics; Ross Eisenbrey, Vice President, Economic Policy Institute; and Demetrios G. Papademetriou, MPI President. Discussion on MPI report, Migration's Middlemen: Regulating Recruitment Agencies in the Philippines-United Arab Emirates Corridor, which examines recruiters' practices as well as their regulation by the Philippine and UAE governments, finding room for significant improvement. Speakers at the briefing: report author Dovelyn Rannveig Agunias, MPI Policy Analyst; Luzviminda Padilla, Labor Attaché, Philippines Embassy in Washington; Jeni Klugman, Director, Human Development Report Office, United Nations Development Program; and Kathleen Newland, MPI Director of the Migrants, Migration, and Development Program.